It's official — Sandy now has a new mayor and a new Position 2 city councilor. Mayor Stan Pulliam and Councilor Laurie Smallwood took their first oaths of office at the Monday, Jan. 7, Sandy City Council meeting. Pulliam, a Sandy High graduate and commercial insurance industry executive, was elected over four-term mayor Bill King in November. Pulliam also has served on the Sandy Area Chamber of Commerce Government Affairs Committee, the Sandy Community Action Center Board and the board for the nonprofit Children's Course. Smallwood is a 22-year Sandy resident who works as a firefighter/paramedic for the Sandy Fire District. She has served on the city Budget Committee and the board for East Clackamas County EMS and teaches CPR classes for several local businesses. 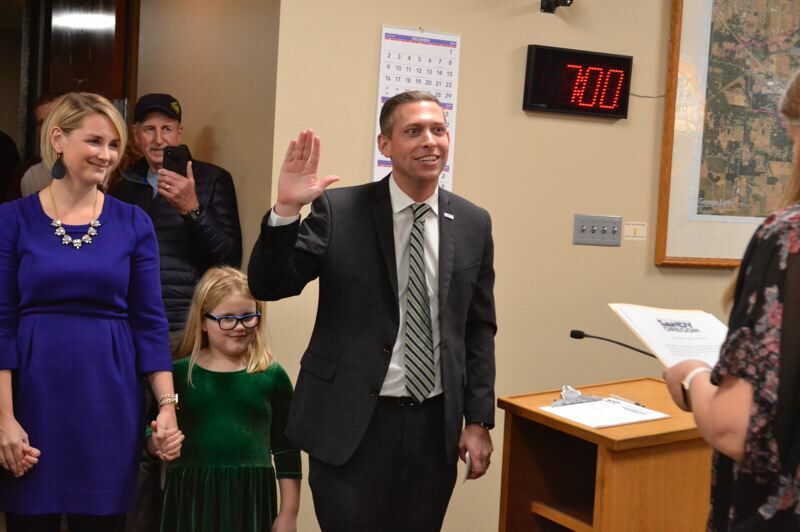 Council President Jeremy Pietzold was sworn in again and re-elected as council president for his seventh term in office. "I think we have a new city manager and a new mayor, and Jeremy's been here the longest, so I think he should remain president to provide guidance," Councilor John Hamblin noted. Councilor Carl Exner took the oath to remain in Position 5 for his fifth term in office. Following his swearing-in, Pulliam delivered a speech detailing the events of his Sandy childhood and how they led him to this point. "I'm the man and the leader that sits before you tonight only thanks to our community and the amazing organizations within the city of Sandy," Pulliam said. "And with unprecedented challenges facing us, I'll need every ounce of those skills and leadership qualities that were provided to me. Today, Sandy sits at a crossroads — standing between what we once were and what we're destined to become. It is up to us as council and me as mayor to provide a vision for our neighbors here in Sandy, a vision that brings us into the 21st century."